NAGA CITY—Officer-in-Charge (OIC) Philippine National Police (PNP) City Director Senior Supt. Filmore Escobal has been relieved of his post at the Naga City Police Office, Police Regional Office V and reassigned to Police Regional Office XI. 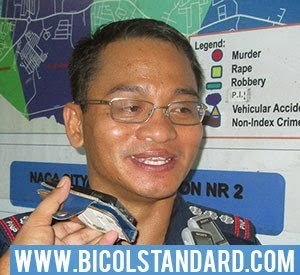 In an interview with BICOL STANDARD over mobile phone, Escobal confirmed that the reassignment was pursuant to Special Order 197 dated January 14, 2015 by command of ‎OIC PNP chief Deputy Director General Leonardo Espina under authority of the National Police Commission (NAPOLCOM). He added that he left Naga with a heavy heart. Escobal, prior to assuming office as OIC PNP City Director on June 1, 2014, was assigned in Davao City. A mere four months after assuming his post here, however, he revealed having felt the relationship between him and City Administrator Florencio “Jun” Mongoso had soured. Meanwhile, City Mayor John Bongat expressed in October that Escobal is free to leave if he wants to. The outgoing City Director earlier explained that relief and reassignment are normal in the PNP.